Simon (darkside) Jackson, Friend of the Blog, has JUST the post for you! 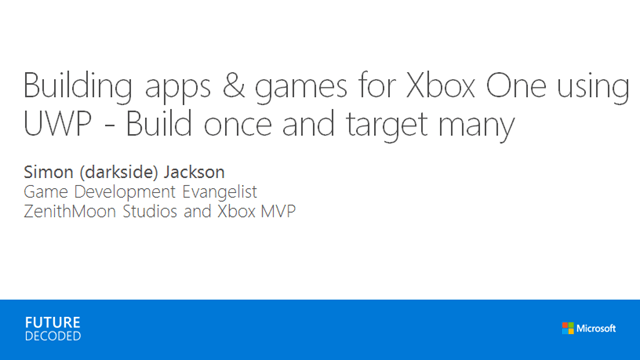 “For my sins, I was asked back to FutureDecoded again this year to give a talk on the Microsoft UWP platform, specifically about bringing games to the XboxOne using UWP. By all accounts the session went well (especially as there was standing room only by the time the talk started). With it being just two days in the London ExCeL exhibition center, not everyone who wanted to make it could, in fact even some people were contacting me on the day saying they were in other sessions at that time but wanted more info.